Where The World Can Find Security Portals for unmanned building access !! AN UNMANNED SECURITY SYSTEM THAT PAYS FOR ITSELF! 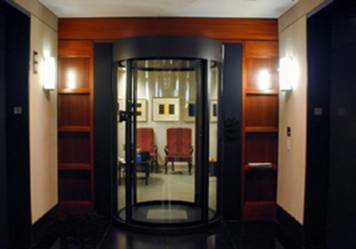 The Interlocking Door System utilizes state-of-the-art technology to customize entrance security solutions based on the level of security required. The Interlocking Door System is a metal detection and/or a single entry access control system that prevents piggybacking and tailgating of people pushing to quickly get through. In most applications, security personnel are not required to monitor a building entrance so as to ensure a weapon-free environment and to prevent unauthorized entry. An individual enters the cabin through the first sliding semi-circular door by pushing a button for access or via any form of personal verification chosen. If the person enters the cabin without any metal objects the first door closes automatically and the second door opens to allow access. However, if the person enters the cabin with a sufficient amount of metal enough to alarm the internal metal detector, a voice synthesizer will generate a request for the individual to step out of the cabin and reenter without the metal objects. Once the entry or exit has been completed, the internal volume is measured to ensure that no object has been left in the cabin by means of a sophisticated volumetric sensing system. If nothing is detected, the system is cleared for the next individual. An individual can be requested to deposit the metal object into a special box/locker available at the entrance outside the cabin. The metal detection system allows for access with keys, cellular phones, pagers and similar devices for uninterrupted access. An individual enters the cabin through the first sliding semi-circular door by pushing a button for access or via any form of personal verification chosen. Once inside the cabin, the first door behind the person closes and the patented �Stationary Object Detector" scans the cabin with an ultrasound sensor to ensure that only one person has entered. If more than one person has entered the cabin, access is denied. A voice synthesizer generates a request for the individuals to enter one at a time. When only one person is in the cabin, the second door opens to allow access. The system prevents piggybacking and tailgating, by not allowing the simultaneous transit of two people through the cabin. The entire process takes approximately 6 - 10 seconds depending on the type and weight of the glass deployed. The Portals can be connected directly to a building's fire alarm system. When the fire alarm is activated, both cabin doors open immediately allowing for evacuation. In the case where power is lost, the cabin has a 2 hour battery backup system for continuous use. In the event the battery backup system fails or electricity is not restored within 2 hours, the cabin can be manually opened with a mechanical release lever that releases the door on the public side. A hand crank is provided to open the door on the security side. At any time, both doors could be opened from the control panel by the building administrator for continuous entry and egress. If the cabin has metal detection, it could be used similar to a stand-alone device without single transit control. In the remote event during normal operations that the cabin doors fail to open and the building is unattended, there is a call button inside the cabin utilizing a standard phone connection or cellular connection to an alarm monitoring station for immediate action. Depending on the selection of glass (i.e. : Vandal Resistant vs. Bullet Resistant Level 3) and/or the selection of door type (i.e. : Single Door vs. Bi-Parting Door) traffic consistently moves through the cabin at the rate of 150 to 500 people per hour. In contrast, stand-alone metal detectors typically deployed in airports generate false readings that require security guards to manually scan individuals, which interrupts and delays traffic flow. Typically, throughput with stand-alone metal detectors in airports during high traffic periods at the rate of 180 to 240 people per hour. 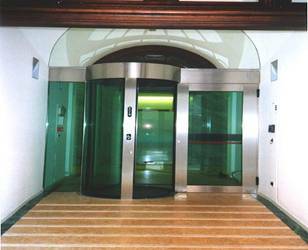 Interlocking Doors provide a higher consistent throughput in high traffic flow environments.